You want to see your glass surfaces look pristine without spending time, effort and a great deal of cash? You can achieve this now – just let the professionals of window cleaning in Battersea manage this chore for you. We will make sure that all parts of your windows are in squeaky clean condition – glass surfaces, frames and window sills. You can rest assured that your property is time for free indispensable. work this is not all – the But to opportunity will come to you save time and efforts with together numerous. We also provide our professional services in nearby areas: Mortlake, Tooting Bec, North Kensington, South Kensington, Clapham. You will appreciate the perfectly looking office with the help of the adepts of commercial window cleaning. You can rely on our first-class services for all types of business premises. For example, if you own a small shop, we can carefully wash its windows by using water fed extension pole tools – it gives us the chance to reach up to the fourth floor. If you seek spotless look for the glass panes of a tall business property in London and the neighbouring areas, we will use our rope access tools. In both cases, you will enjoy superb results in no time. The technicians have the abilities and the essential equipment to provide you with both private and commercial window cleaning. You can count on us for every kind of glass surface cleaning. For instance, we can clean small or double windows, French doors, sash windows, bay windows and patio doors. In addition, if you have garden glass surfaces, conservatory or roof windows, we can clean them as well. We use the most advanced techniques and the most advanced equipment for all the previously mentioned window types. We use the most exceptional methods to be sure that you get second-to-none window cleaning. With our water-fed extension pole cleaning system and jet washing methods, you will enjoy spotless look of your glass surfaces. We attach our poles to water supply in our vehicles to ensure that there is no danger for the exterior of your residence or business building. For higher windows, we employ absolutely secured rope access approach. You can benefit from these cleaning techniques now – just ring 020 3746 3113! 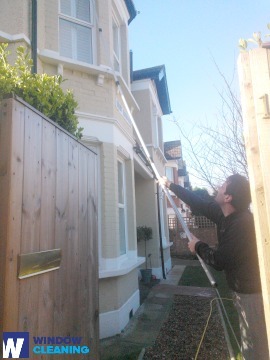 With our quick and excellent domestic window cleaning in Battersea, you will enhance the look of your home immediately. We use purified water for inside and outside cleaning of your windows. We make this possible by using ground based water-fed extension pole system, which is safe both for your dwelling and the cleaners. Learn more – call us on 020 3746 3113 or use our online booking form. For your convenience we have a chat facility. Our assistants are active 24/7 – you will get answers to your questions. You can be one of our satisfied customers now!